What Training Have You Done Today? Re: What Training Have You Done Today? Weights session at the club followed by 30:00 strapless SS. Nice easy stuff, exactly 5 splits above my 30r20 PB. It's very odd rowing strapless! Fourth split, I took a deep breath, and a few hundred metres easy before launching at the final 2k. Went well I think. Followed by some abs, stretching, bouldering and playing on the rings. 56yo, 6'2" 77.5kg. Cyclist, rock climber and recently, erger. Don't neglect the longer intervals: 750m, 1000m, 1500m. These are important too. You want to have about "equal" rest. So for 750m go for 3 minutes rest, 1000m go for 4 minutes rest, etc. Good advice. I spent a great chunk of this year doing tons of SS meters and also some quick, fun, fast work but very little doing longer intervals or AT work. I'm seeing the results of that now. I still have two months before my race but I'm realizing that I probably needed more 30 minute or 5K harder efforts (or intermediate interval work occasionally) now. 2×6000m at moderate pace, wouldn't say it was really easy. Targets were 2:03.8 (5k+10) for everything except last 300 of the 2nd. Happy with this. It wasn't SS but it definitely wasn't hard. Last 300 must have been around 1:42 or 3 but that wasn't r20! Not the most exciting of ergos but good training nonetheless. Had wicked afterburn from this piece... felt good. 5x (5' on / 5' off) @ open rate is still one of my all time favorite workouts. 2 (10 x 30' on @ r30 + 1:00 off @ r18-20 paddle): avg about 1:38.5 r30 on the "on" and 2:30 r20 on the "off"
10k at r20 to learn how to pull hard again, and concentrate on the action and recruitment. Tried for the OCD of R20 all the way at a 2:00 pace. Not quite got the pace judgement back, but close. Abs, stretching, lock offs on rings, dumbell curls. @ Bill - Thanks, like the simplicity! Today was SS work again. 6K X 2/1'. Been reducing the rest on these from 3 to 1 minute. 2:09/22 and 2:07/23. Feeling stronger on these longish SS rows. Before the meters were getting to me. Today is my last day before a rest day and I'm feeling pretty good (and did relatively all week). Next week I begin the full PP to prepare for my race in February. Not sure if I'll cut back meters or not. Probably so. I'm at 65Kish a week now. Probably cut back to around 55ish and increase the intensity. Nice work Mike! What race do you have coming up? I'm hoping to try my first race either 2/3 or 2/4 in Central California. Tightened the screws a little more for this Friday's sprint work. 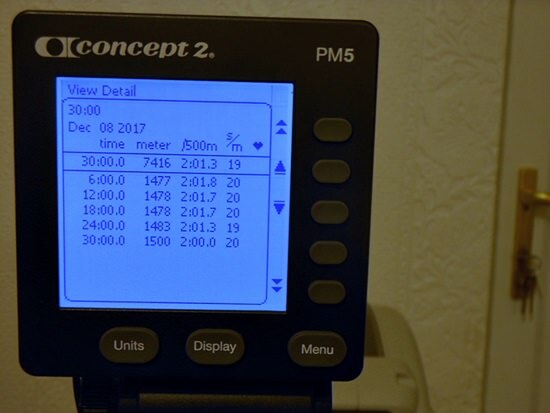 8 x 500/3R @ 1:45.2 avg. Still have a ways to go to hit 7, but a nice step in the right direction! This is my first real session since last sundays 10k! Plan was r20, but the PM rounded the average out r19, probably why it felt like tougher work though too. Happy with this solid piece of work today. Super impressed with your pacing and rating discipline Anth! Good job on yet another really solid workout.